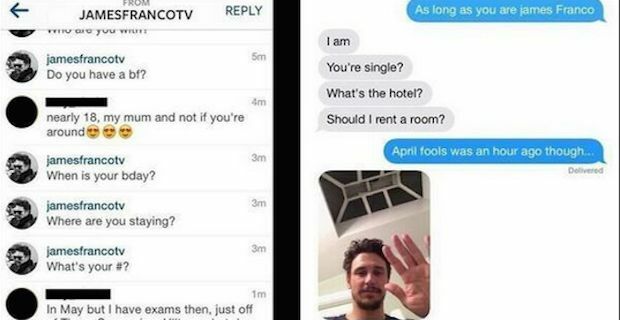 James Franco is causing quite a stir after screenshots of a conversation he had with a 17 year teenager on Instagram was leaked. Franco has reacted by tweeting a meme featuring a picture of him and the quote "Why are you thirsty for underage ones" and then a second tweet saying "I’m not! I hope parents keep their teens away from me! Thank you". 17 year old Lucy Clode from Scotland was in New York with her mother for a holiday when she bumped into Franco after his performance in Of Mice and Men on Broadway. Franco came over to Clode and as she recorded him on her phone he suggested that she tag him when the image was uploaded. Clode duly tagged him and he quickly got in touch with her through Instagram to see if she was interested in a meet up. Franco seemed to be in inquisitive mode as he asked her how old she was, did she have a boyfriend and where she was staying. Franco even asked if he should rent a room at a hotel for the meet up. Many people online are are skeptical of the whole episode however. The story is likely to be a bid to drum up publicity ahead of the release of Franco's new movie Palo Alto. The film has already played at a couple of film festivals before Christmas and is due to appear at the Tribeca Film Festival later this month. In the movie, Franco plays a high school soccer coach who enters a relationship with one of his students. Given this coincidence and his blasé response to the furore on Twitter it is quite likely that this is all a carefully orchestrated stunt.